About two years ago I had the pleasure of sitting down for dinner with Rod Emory. Over the mutli-course meal provided by our friends at Michelin, I had the opportunity to listen at length to a bona-fide Porsche legend. Rod turned out to be soft-spoken and unfailingly modest. 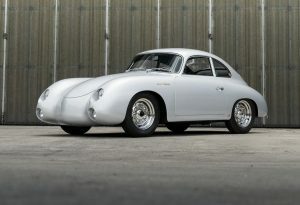 His calm manner seemingly only built in furor when discussing clever solutions to the quirks of classic Porsches. Though best known for his signature Outlaws, which range from relatively tame to the wildest 356-based creations ever conceived, Rod also restores classic Porsches to their former glory. This car, a 1957 Speedster, is a mix of the two styles. A racecar from nearly new, this ’57 Speedster was one of about twenty similar cars that participated in the Speedster Wars on California circuits in the 50s and 60s. By the time it came to Rod in the late 1990s, decades of competition had left the car rather ragged. The owner wished to continue to race the car, and as such it received a new nose, extensive bodywork, and chassis stiffening. Rod also crafted a custom headrest, faring, metal tonneau cover, and even integrated concealed suspension adjusters into the cockpit. Curiously though, the car was to remain road-legal, allowing it to participate in road rallies as well as circuit events. 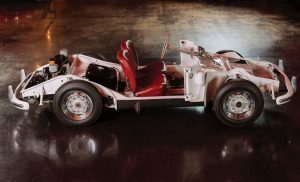 After years of use in its open-top configuration, the owner commissioned a brave addition- a Glaspar removable hardtop that accommodated the faring behind the driver’s headrest. To the average home fabricator, this would be an unbelievable challenge. To Rod, this, and all the other difficulties involved in constructing this car, were just another day at the office for the world’s most demure Porsche fabricator. Build photos for this distinctive Speedster can be found on the Emory Motorsports website. ’58 Porsche 356 A 1600 Speedster : Episode 1 !